Hello everyone! The past two days have been very busy for me and hubby, but good kind of busy. Yesterday we got to meet up with two of my crafty girlfriends, Isha and Beck (they are both here in Phoenix for a Design Team retreat), it was so nice to get together and chat about all sorts of things. And today we spend the entire evening putting together my new desk (I was using a cheap table from Walmart and just ordered a big new desk recently). I have a photo at the end of this post if you’d like to take a look. And tomorrow we are going to “Junk in a Trunk“ event here in Phoenix (never been to one, so I’m very excited). But today’s post is not about that! 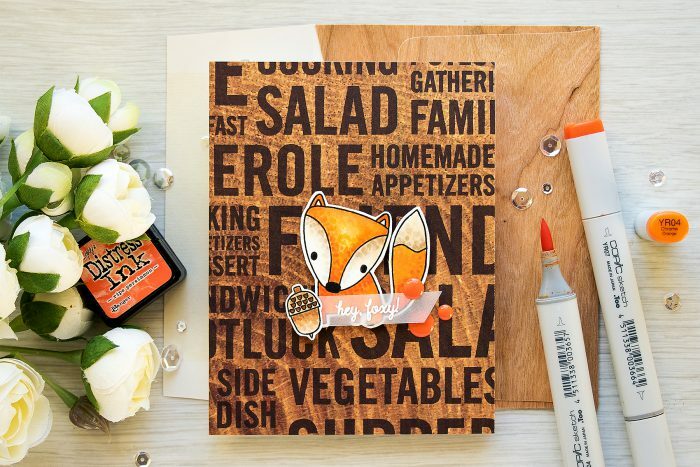 STAMPtember is in full swing at Simon Says Stamp and today is yet another collaboration day – Avery Elle! They designed the most gorgeous snowflake set! I love snowflakes and I always hoard good snowflake design stamps and dies so this set just made to the top of my favorites. First I heat embossed a background using white embossing powder and blended several colors of Distress inks (all listed below) to create a gradient. I made an A2 top folding card base, added a strip of gold glitter paper and adhered my ink blended background on top. 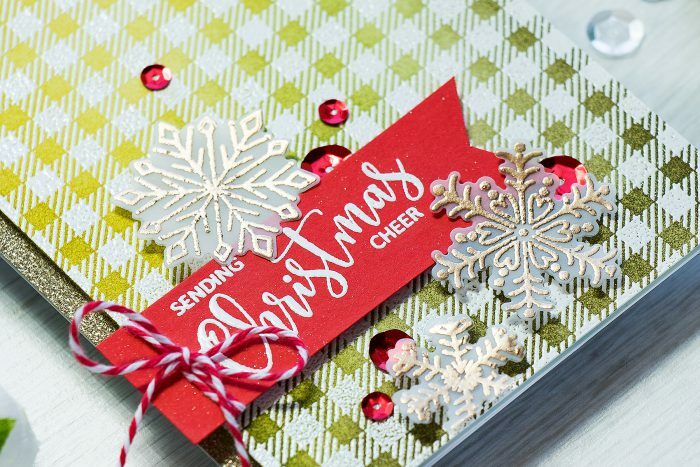 Next I heat embossed a beautiful Sending Christmas Cheer sentiment in white embossing powder onto red cardstock, trimmed into a banner and foam mounted onto my card. 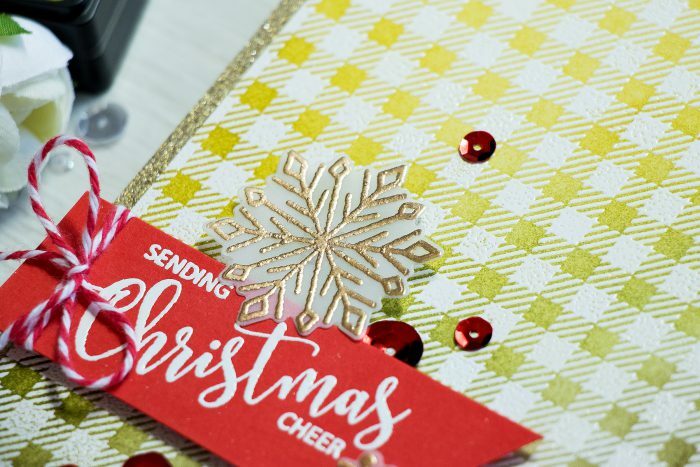 I also couldn’t resist heat embossing several snowflakes using Rose Gold embossing powder onto vellum and cutting them out using coordinating dies. I foam mounted them for a pop of dimension. Going through my supplies a few days ago I found a pack of self adhesive sequins so I added those onto my card well. Lastly, I tied a little bow using red and white bakers twine. Here’s a photo of my desk – I love how much room I have here; I still have lots to organize and some drawers to fill but I am pretty excited! Thanks for stopping by today! I’ll be back soon with more cards! Congrats on the new desk. It’s a beauty! This card is so awesome. Love vintage motives in its design. This is beautiful Yana, I too am a huge fan of beautiful snowflakes and these ARE beautiful. Hi, Yana! 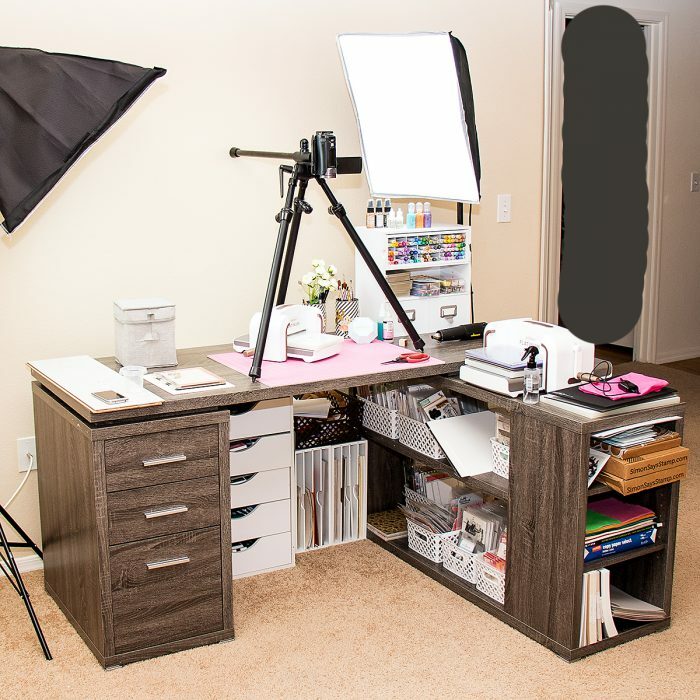 I saw the picture of your desk on your Insta and my eyes were caught by your tripod:)) any chance to know what brand it is? thx so much! Hi Yana! I’m jealous Imwish I lived close enough to either Junk in the trunk stores. I hope you find lots of good treasures. 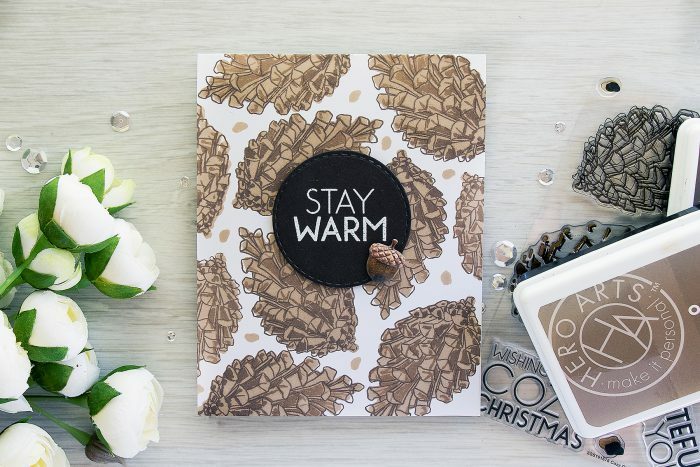 Beautiful card, I looove snowflakes to, you can never have enough stamps and dies of snowflakes right! Great desk, looks like it holds a lot. That’s awesome,,all your supplies are really close by. Well have fun tomorrow and make sure to share the treasures you find. Thanks for sharing and inspiring. 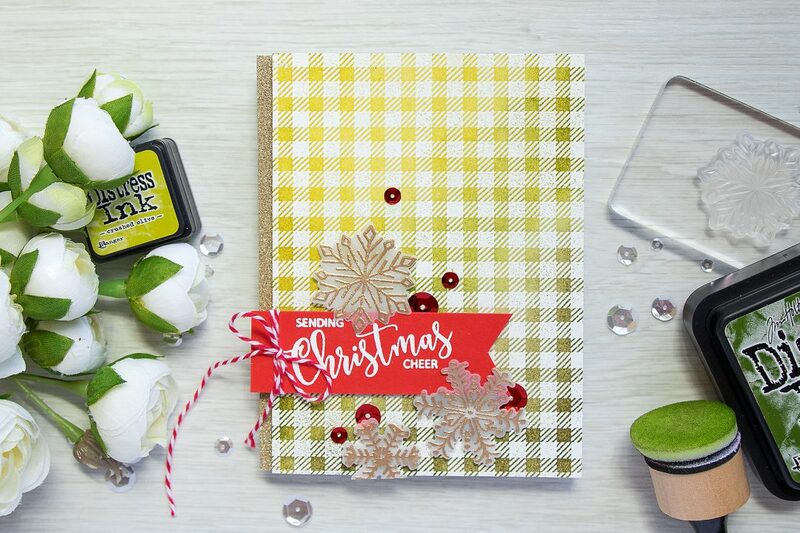 Hello Yana, great news that your crafting space is coming together – it’s so organized too! Exciting to meet up with Isha (and Beck)! Your card is quite simply put – beautiful! 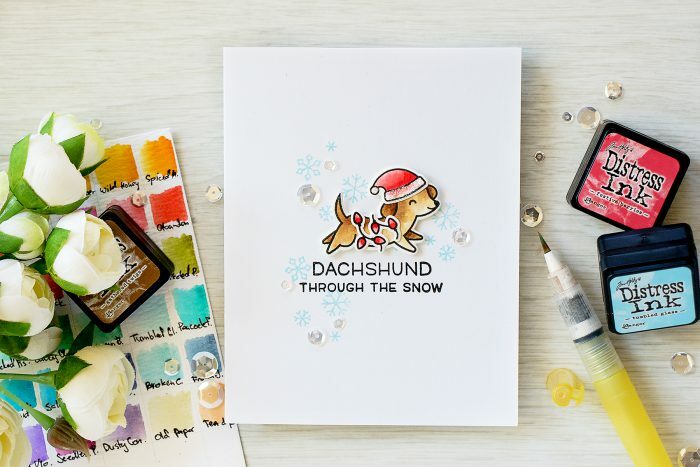 At first I thought it was white embossing on gold card-stock – lol! Hope you “found” some good stuff at the trunk show! Very beautiful card Yana ! Love this gingham background ! And congrats for your new craft space ! Love your cards as usual 😉 Where did you get your desk and the white drawers under your desk left side? Thank you for your inspiration and enjoy the USA! What a lovely card! Love your desk, Yana. I am always impressed with your photos and videos. Would you be able to share a video / photos / links to equipments of how you do it? 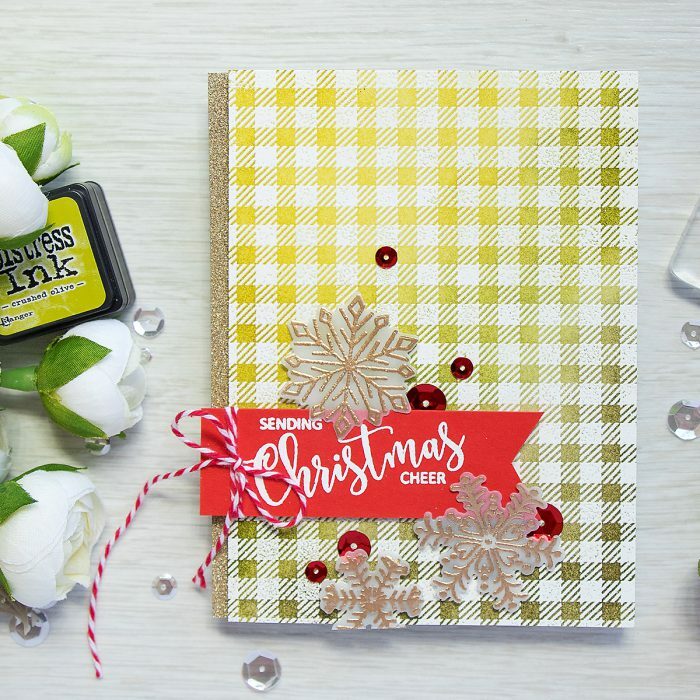 That will be so helpful to paper craft bloggers like me!! Thanks so much for all the inspiration you always provide!